- One feeder from day old to finish. - Avoids feed wastage during early rearing period. - Auto Pan Depth adjustment to suit day old & grownup birds. 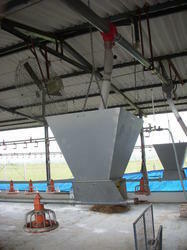 - Avoids feed contamination due to mixing of litter in the feed. The Ezypan Feeding System feeding system with centralized feed level adjustment represents a major technological innovation. This helps in minimizing feed waste, labour and helps maintain excellent hygienic conditions for the birds. Being a noteworthy enterprise of this industry, we are offering a wide spectrum of Automatic Pan Feeding System.